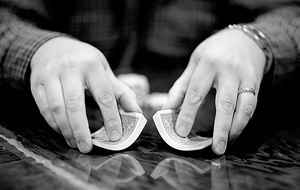 For a new player poker becomes a form of entertainment and a way to meet new people and learn the skill of the game. However, after a certain point it would generally become much more important and becomes a part of who the player is. That’s when players start depending on poker for money and it slowly becomes a way of fulfilling the player’s psychological and social needs. At any given time hundreds of poker players are deciding whether or not to consider taking up poker as their main profession. People think that being a pro is easy, you just have to read a lot and learn from the seasoned players and then you would be able to make good enough money consistently. But that’s not all there is to it. You may choose to play video poker online or casino games when you are at an online casino. The bottomline is that if Lady Luck smiles on you and you are doing it all right, then Lady Luck will smile on you in whichever game you are playing. So go ahead and have yourself a good time. Take the example of Dr Aigner who kept his successful medicine practice on hold to try the life of a professional poker player. After giving enough thought and consideration to this decision he decided to go ahead and live the life of a pro. He doesn’t treat patients anymore, instead spends his time playing at online poker sites and travels to play in high level poker tournaments. He puts in hours trying to study the intricacies of the game. But Dr Aigner is not alone. There are plenty of other people who have chosen to go down the same lane. The new pro genre comes from a wide variety of backgrounds, professors, housewives, college students and businessmen. It doesn’t matter what their background is, they are all up against the same thing- the psychological pressures of being a poker pro. One would think that since the game and the strategies all remain the same, a player who is successful at a low limit game would also be successful at a high limit game. But what most people don’t realize is the extreme mental pressure of being a professional would in fact affect all the aspects of life as well as the way the game is played. New professionals soon understand that being a poker pro is not a regular type of profession and they experience several road blocks and pit falls. We need to be a part of something in our career and in our life. But a poker professional would be deprived of all that since there is no set routine, contracts or even set hours for the profession. And playing alone can make you feel lonely and empty after a while. Professional poker players would go on a roller coaster of high emotions and stress, and the energy can slowly drain out and even the profits can dwindle quicker than you would realize. For those who are not yet prepared for it, this could be extremely stressful. And in time they usually get back to the job they had quit in order to become a pro. There are plenty of people who fail to make it as a pro, but there are also handfuls that make it. These are the ones that fight against all the odds, battle against the stress, manage their money cleverly. These are the ones who have high self confidence, intelligence and determination. They are generally good at self evaluation and observational skills. If you are thinking of becoming a poker pro think of all the things that would be involved in your decision before you go ahead and quit your job. You would need to build up some skills and gear yourself up to handle all that pressure.